The Nintendo 2DS will go on sale in the UK on October 12. The system will be priced at £109.99 and you can go pre-order it right now over at GAME. The console offers a more affordable alternative to the standard 3DS and the beefier 3DS XL. The 2DS has all the buttons and controls of both but drops the clamshell design and of course the 3D capabilities. Needless to say, the console has been received with a lot of confusion. But remember that this is aimed at a younger audience than its 3D siblings are. Kids and hinges don't mix well. A source from Nintendo of America confirmed yesterday that the display is actually one touchscreen divided by a thin piece of plastic. 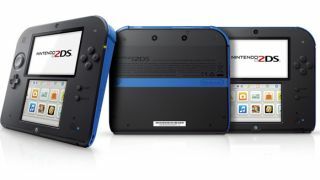 The 2DS will be available in black/blue version and white/red. Bizarre design choices aside, we have to say that we're loving the colour combo on the latter. Keep your eyes peeled for TechRadar's hands on review coming very soon.